B2Lead is your lead generation and online marketing partner. B2Lead reaches your B2B audience through lead generation campaigns to verified B2B contacts and extends the reach of your content through online publishing and social channels. Publishing B2B content can start a dialogue with early-stage prospects who might be considering your solution. Our sites are a resource for information that addresses B2B issues and challenges when audiences are in that all-important research phase. Content found online can answer questions potential customers are asking before they reach out — and drive traffic to your company site. B2lead works with some of the most popular B2B content sites to syndicate your content. 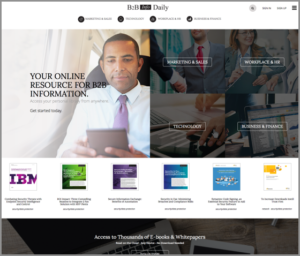 B2B topics such as technology, security, big data, sales and marketing, finance, HR, and more can be found on our sites and our partner sites. We partner with Madison Logic, Integrate (Premium Media Partner), NetLine and many others to syndicate and support your message. Domestic – We partner with companies that have broad technology categories as well as categories such as Human Resources, Finance, and Manufacturing. International – We partner with companies that have a global reach and international audience. 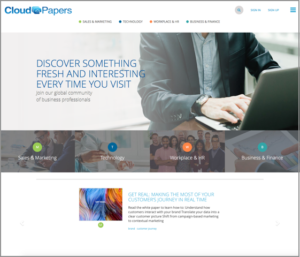 B2BinfoDaily.com and CloudPapers.com offer enhanced user experience through the LeadStory Platform. Readers don’t have to download content or install an app to see your content from the viewer. They can save their favorite content to the library that can be viewed from any device. Visitors can share your content via social media and email directly from the LeadStory Viewer.